These woodlands in the Vale of Ffestiniog are remnants of the Atlantic Oakwoods that once covered much of the coasts of Europe, extending down from Northern Scotland as far down as Portugal. Because of the steep rocky gorges and waterfalls they have very high humidity and are sometimes referred to as 'Temperate Rain Forests'. 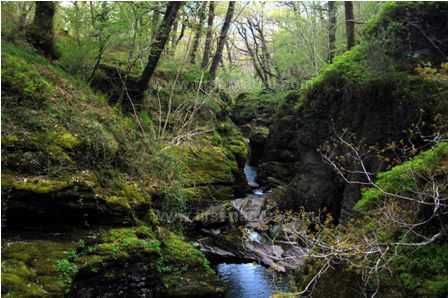 Together, the Atlantic coastal woodlands of northwest Wales form the Meirionydd Oakwoods and Bat Sites SAC. There are a number of nature reserves throughout the area, although not all of them are suitable and safe for public access due to the precipitous nature of their terrain. These woods are home to many rare and endangered ferns, mosses, liverworts, lichens and fungi that are relicts of the last Ice Age. The woodlands also provide ideal habitat for birds, insects and mammals - particularly bats. 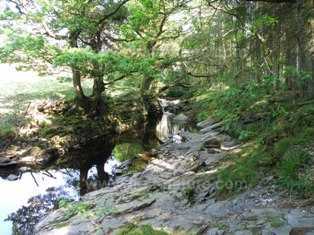 The Meirionydd Oakwoods were orignally designated as NNRs in 2004. Apart from the woodlands themselves, the area has other important habitats including a network of heaths, species-rich marsh, wet grassland, and a dynamic floodplain. These areas outside the woodland support many plants and animals - the floodplain is an important refuge for wildfowl, and among the special plants are Globeflower (Trollius europaeus), and Creeping-jenny (Lysimachia nummularia). It is in part due to the inaccessibility of many of these woodlands, which are mainly situated in steep, rocky river gorges, that some of them remain in almost pristine condition. Even those sites that have been damaged over the years by conversion to agricultural or forestry land are well worth restoration, because the seeds of flowering plants and trees that have remained within the soil can still germinate and grow even after many years of lying dormant. A number of restoration and management programmes are in progress within the Meirionydd Oakwoods. Of the eight nature reserves in the Meirionydd Oakwoods that are managed by Natural Resources Wales (NRW), there are three that are well developed for visitors: Coed Llyn Mair, Ceunant Cynfal and Ceunant Llennyrch. See below for directions and access details. The other five NNRs, which are also described briefly below, are certainly not for the faint-hearted! Not all of them have paths, and where there are paths they are rough, rocky and riddled with tree roots that make the going very tough indeed. The trees are predominantly Sessile Oaks with a few mature Beech trees. In between there are Holly, Hazel, Silver Birch and Rowan. 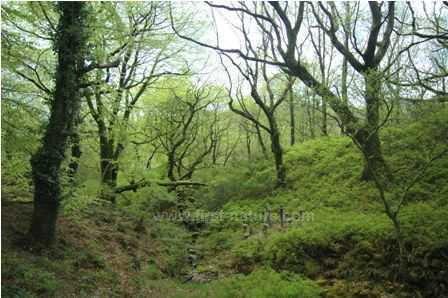 Because of the high humidity, the Meirionydd Oakwoods provide the ideal habitat for ferns, lichens and mosses. More than 200 species of liverworts have been recorded in the woodlands, and among the nationally scarce lichens that have been found there are Graphina ruiziana, which occurs on young birch bark, and Parmeliella Horrescens, which grows on the bark of older birch trees. Amongst the many mosses found on the boulder screes is Wilson's Filmy-fern (Hymenophyllum wilsonii), and there are some plants of Oak Fern (Gymnocarpium dryopteris) as well as Narrow Buckler Fern (Dryopteris carthusiana). During the spring and summer the oak woodlands are alive with birdsong. Among the birds that breed there are Redstarts (Phoenicurus phoenicurus), Pied Flycatchers (Ficedula hypoleuca), Nuthatches (Sitta europaea) and Wood Warblers (Phylloscopus sibilatrix). The drumming call of woodpeckers can often be heard. Many animals make their home in the woodlands, and the smaller ones make good meals for Buzzards (Buteo buteo), which sit silently in the trees waiting for something suitable such as a Bank Vole (Clethrionomys glareolus) or a Long-tailed Field Mouse (Apodemus flavicollis) - also known as the Wood Mouse - to scurry into range. Both of these small mammals have rufous-coloured fur, making them more brightly coloured (and perhaps easier to spot) than some of their browner close relatives such as the Field Vole and the House Mouse. Along the edges of the streams throughout these woodlands Otters (Lutra lutra)can sometimes be seen hunting for fish. The pickings mustsurely be limited, because these steep, acidic rivers are not home to plump trout or any other reasonably sized fish. It is more likely that the Otters rely mainly on a diet of frogs and other amphibians. It is, however, the bats of the Meirionydd Oak Woodlands that make it such an exceptional place. Greater Horseshoe Bat (Rhinolophus ferrumequinum) - Britain's most endangered bat species - and Lesser Horseshoe Bat (Rhinolophus hipposideros) use caves and old buildings in the area to roost and raise young. (The name 'Horseshoe' is a reference to the extraordinary shape of the nose of these bats.) The tree canopy affords the bats good cover, and the humidity encourages a rich community of insects for them to feed on. Other bats known to frequent woodlands in the Vale of Ffestiniog are the Brown Long-eared Bat (Plecotus auritius), Natterer's Bat (Myotis nattereri), Whiskered Bat (Myotis mystacinus) - which sometimes flies by day - Pipistrelle Bat (Pipistrellus pipistrellus), our smallest bat, and the Noctule Bat (Nyctalus noctula). The woodlands themselves are not good places for flowering plants, which play a subordinate role to the mosses, liverworts, ferns and lichens due to the levels of humidity and shade (and the occasional grazing), which don't suit vascular plants well. A few exceptions that appear in some of the less rocky areas are the bright yellow Common Cow-wheat (Melampyrum pratense), and the delicate white-flowered of Wood-sorrel (Oxalis acetosella). The woodland at Ceunant Llennyrch still has traces of the ancient Sessile Oak wood that used to dominate much of this area, but it is now home to Wych Elm and Ash trees as well. The woodland flora is better here than in most of the reserves in the area, and where the land isn't grazed there are carpets of Bilberry (Vaccineum myrtillus) and Ling (Calluna vulgaris). Bryophytes are very well represented and include the total known British population of the rare Prostrate Feather-moss (Sematophyllum demissum) along with Silky Swan-neck Moss (Campylopus setifolius) and Wedge Flapwort (Leptoscyphus cuneifolius). Ferns are also prolific, including Royal Fern (Osmunda regalis), Hay-scented Buckler-fern (Dryopteris aemula) and Tunbridge Filmy Fern (Hymenophyllum tunbrigense). Coedydd Maentwrog comprises two separate woodland sections: Coed Llyn Mair and an adjacent block of three further woods known as Coed Ty Coch, Coed Bronturnor and Coed Glanrafon. 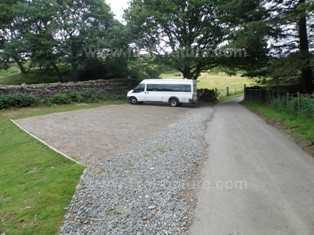 Coed Llyn Mair is very well developed for visitors and has good facilities. This magical woodland nature reserve is described as being a Welsh rainforest, but don’t let that deter you from going there. It is truly a delightful place to visit and has a circular walk of about 3/4km (1/2 mile) through oak woodland and with a small stream that cascades down the hillside beside the path. 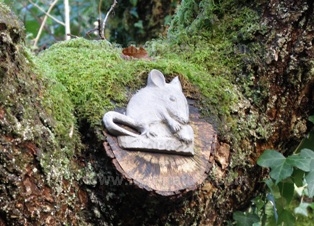 Throughout the woodland there are animal and plant sculptures waiting to be discovered – a special challenge greatly enjoyed by children. Because of its higher-than-average rainfall and humidity, Coed Llyn Mair is home to many kinds of lichens, mosses, liverworts and ferns that cling to the rocks and trees, creating a wonderful atmosphere. Turn on to the B4410 from the A487 road between Porthmadog and Maentwrog at the Oakley Arms Hotel. Continue up the hill for approximately 500m (300yds) until you see Llyn Mair (a beautiful tree-lined lake) on the left and the NNR car park on the right. There is parking for up to 12 cars in the NNR car park overlooking Llyn Mair (the lake), and from the car park there is access to a circular walk of about 800m (1/2 mile). This woodland trail is not suitable for wheelchair users or for prams or pushchairs. The path is steep and rocky in places and can be slippery in winter, so appropriate footwear is called for. There is also parking at Tan y Bwlch railway station, which lies beside the B4410 that runs from Maentwrog to Beddgelert. The station is one of several on the Ffestiniog Railway route from Porthmadog to Blaenau Ffestiniog. Trains run during the summer months. At the top of the walk up from Llyn Mair (about half way round the woodland trail) there is access to Tan y Bwlch Railway Station, where there are toilets, a shop, and a café. This reserve has well-defined paths through woodland and along the edge of a very pretty stream. Below: The A470 road with the parking layby just through Bont Newydd. The lane on the right leads down to the nature reserve. From Blaenau Ffestiniog proceed along the A470 in the direction of Porthmadog/Dolgellau, continue through Llan Ffestiniog to Bont Newydd. Bont Newydd is not signed, so look out for a small bridge over the stream; the bridge is immediately followed by a slight right-hand bend with right turn into a lane onthe right, and 40m further on there is a layby on the left (see picture, left). It is best to park in this layby and then walk back to the lane. Walk down the lane until you come to a house called 'Cynfal' on the right. Take the right hand turn immediately after the house. 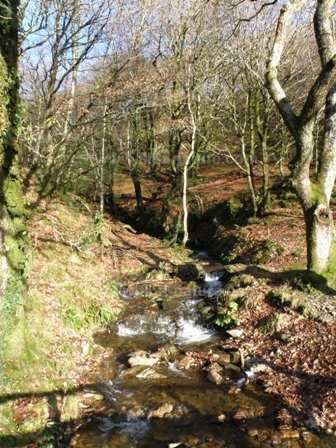 Below: The woodland path in Ceunant Cynfal runs along this pretty steam. The reserve entrance is on the right a few metres further down this lane. There is a network of paths in the reserve which run along the edge of a pretty stream with waterfalls and deep pools, but the paths are narrow and could be slippery after rain, and during the winter. The reserve is not suitable for wheelchair users, prams and pushchairs, or anyone with mobility problems. There are no facilitiesat the site. The nearest public toilets are 5km (3.5 miles) away in Blaenau Ffestiniog, where there are several shops, pubs and cafés. This nature reserve has steep, wooded paths. About 800 metres from the entrance there is a spectacular waterfall. The steep banks are clothed with Bilberry (Vaccinium myrtillus) and woodland wildflowers in the summer. From Porthmadog take the A487 in the direction of Dolgellau and then turn right towards Maentwrog on the A496. Continue down this road and then turn left towards Gellylidan which is via a minor, narrow road with gates along the way. 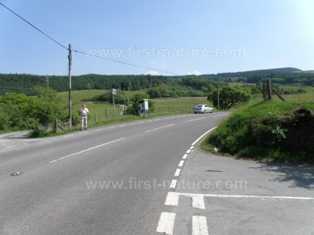 Although there is no official car park at the reserve, there is room for several cars on the road, and there is a layby just before the reserve - see picture on right - that can accommodate several cars. There is an unsigned kissing-gate on the right-hand side of the road as you walk up from the parking layby; this leads into a field which, in turn, takes you to the entrance to the Nature Reserve. 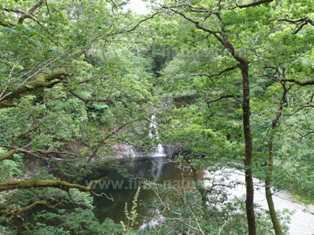 Below: The lovely waterfall in Ceunant Cynfal NNR. The paths through the wood are narrow, quite steep and have many steps. The 800 metre (1/2 mile) walk to the waterfall is steep in places but well worth the effort. The reserve is not suitable for wheelchair users, prams and pushchairs, or anyone with mobility problems. There are no facilities at the reserve. This nature reserve, managed by CCW, has a short footpath to the water cascades but is otherwise steep and inaccessible. This nature reserve, managed by CCW, has no public access and is unsafe due to serious rockfalls. This nature reserve, managed by CCW, has a steep, rocky path to a waterfall but is otherwise not suitable for public access. This nature reserve, managed by CCW, is the least accessible of the oakwood nature reserves. This nature reserve, managed by CCW, has no footpaths and the terrain is not suitable for public access.